Here are the discussion questions that accompany my message, “Is Jesus Really the Source of Truth?,” from this past weekend at Eastbrook Church. This is the second part of our series, “3 Questions We All Have About Jesus,” where we are digging into Jesus’ provocative statement: “I am the way and the truth and the life. No one comes to the Father except through me” (John 14:6). When did you learn something that changed your life, whether as a child or as an adult? What happened? 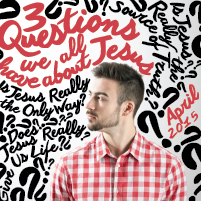 This week we enter the second part of a three-week series entitled “3 Questions We All Have About Jesus.” In John 14:6 Jesus says, “I am the way and the truth and the life. No one comes to the Father except through me.” Before you begin this study, ask God to reveal His truth to you as you read His word. Given everything you just read, what do you think is important about Jesus including ‘truth’ in His statement to the disciples in John 14:6? Why do you think it is important that Jesus includes this? How have you wrestled with questions about the truth in your own life? Has your knowledge of Jesus resolved those questions? How? Jesus is described as coming from God the Father “full of grace and truth” (John 1:14, 17). Many times Christians are criticized for being arrogant in their claims to truth or in the way they talk about the truth. Do you think these criticisms are valid? Why or why not? What do you think it looks like to be full of grace and truth? In John 8:31-32, Jesus says, “If you hold to my teaching, you are really my disciples. Then you will know the truth, and the truth will set you free.” Based on the surrounding verses in John 8 and your own reflections, what do you think it means to be set free by the truth of Jesus? What is one specific thing that God is speaking to you through this study about the truth of God found in Jesus? How will that shape your life in the coming week? If you are with a small group, discuss that with one another and pray for one another. If you are studying on your own, write it down and share it with someone. Is Jesus Really the Source of Truth? Does Jesus Really Give Us Life?